Juvenilia is defined as works produced by an author while still young. Juvenilia can provide unique insights into a creator’s early influences and the evolution of their writing. For many reasons, researchers will unfortunately find that examples of juvenilia are not always present amongst an author’s papers. Over time, juvenilia might go missing, be discarded, or even destroyed. Some famous examples of lost juvenilia include Ernest Hemingway’s early works. When Hemingway was 23, a suitcase full of his early drafts and their carbon copies was stolen at a train station. All that remained of his early works, then, were a couple of short stories, a poem and some carbon copies of articles he had written. In the case of Truman Capote, his lost juvenilia weren’t really lost at all. Upon his death, his papers were donated to the New York Public Library (NYPL). Amongst them were several short stories written by Capote in his teens and early 20s. In 2013, a researcher came across the stories, and in 2015 they were published in The Early Stories of Truman Capote (Random House) and hailed as newly discovered texts. However, the NYPL’s Manuscripts and Archives Division was quick to make the distinction between “undiscovered” and “unpublished” in the media. While the stories had not necessarily ever been in print, they had been catalogued and were available to anyone wishing to consult Capote’s papers. Though there are many reasons why early works might not find their way into the archives, Library and Archives Canada’s Literary Archives Collection is fortunate to include a variety of pieces of juvenilia. One very special example comes from the Jane Urquhart fonds. The celebrated author of such works as The Underpainter and The Stone Carvers showed an early interest in creative pursuits. Urquhart (née Carter) was keen to experiment with different literary forms and studied acting from a young age. As a girl in the 1950s, she loved the books of Lucy Maud Montgomery, and adapted the novel Anne of Green Gables into a play. Written in a blue Hilroy notebook, an elementary school mainstay for decades, Urquhart’s play opens with the familiar scene of Matthew Cuthbert and Anne Shirley in what Urquhart describes as a stage coach, on their way to Green Gables for the first time. While the script represents only a small portion of Lucy Maud Montgomery’s novel, the text illuminates Urquhart’s own early reading interests and writing style. Even at such a young age, Urquhart follows the conventions of scriptwriting by beginning with a setting description and designating dialogue to different speakers. She was perhaps familiar with how a script is formatted because of her interest in acting. Within a few years of drafting her adaptation of Anne of Green Gables, Urquhart was a member of an acting workshop under the direction of Canadian theatre pioneer Dora Mavor Moore. What makes this example of juvenilia even more important is how it contributes to our understanding of the lasting influence of Lucy Maud Montgomery and her works on Urquhart. Montgomery’s novels continue to have a worldwide audience, even though more than a century has elapsed since the original publication of Anne of Green Gables. Like many girls and boys, Urquhart discovered Montgomery’s novels as a child. Urquhart, however, had the unique opportunity of reflecting on Montgomery and her works as an adult, formally encapsulating her feelings about the books and their author in a biography written for Penguin Canada’s Extraordinary Canadians series. L. M. Montgomery was published in 2009. In it, Urquhart examines Lucy Maud Montgomery, the writer and the woman. She describes the struggles of an author who achieves commercial success, but who is ignored by literary critics who dismiss her writing as sentimental and lowbrow—criticisms levelled at female Canadian authors such as Carol Shields even decades later. Perhaps the most personal section of the biography is the final chapter entitled, “Her Reader.” In it, Urquhart describes an 11-year-old girl’s discovery of Anne Shirley in the 1920s, an experience that provokes the desire to write herself. That young girl, Marian, grew up to be Jane Urquhart’s mother, and it was Marian’s own copy of Montgomery’s first novel that Urquhart read as a child, inspiring one of her very first literary efforts. 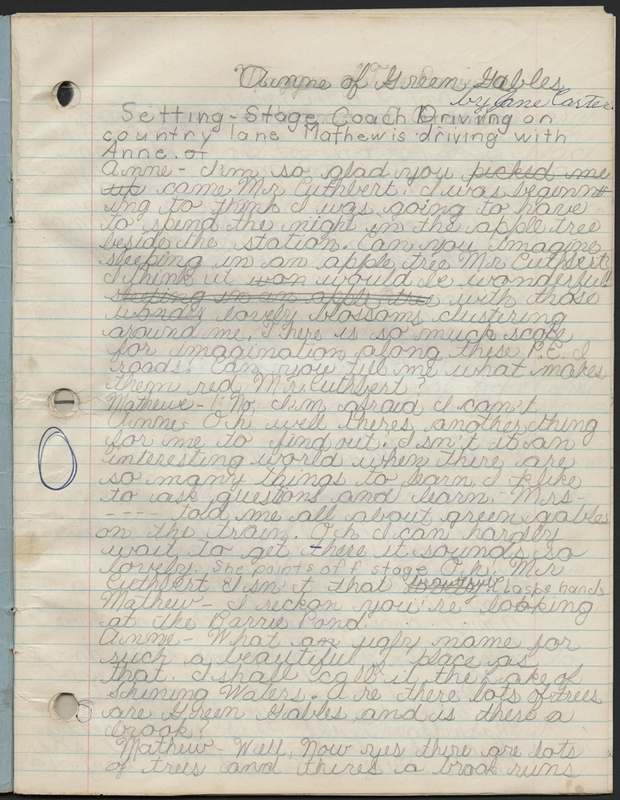 This example of juvenilia and others can be found in fonds within the Literary Archives Collection. To browse the collection, visit LAC’s website. Sara Viinalas-Smith is a literary archivist (English language) in the Social Life and Culture Private Archives Division of Library and Archives Canada. This entry was posted in Literature, Our Collection and Facilities by Library and Archives Canada Blog. Bookmark the permalink.